Handling a powder, such as phosphate, with highly variable flow properties can be challenging. The state of the material can change in reaction to various factors including composition, temperature, residence time, and consolidating pressures in the hopper. Undertaking powder testing allowed Ajax to determine the hopper wall inclination needed for phosphate powder mass flow, to increase the mean residence time of the hopper contents, and enhance de-aeration. Ajax recommended replacement of the bottom section of the hopper, and designed a hopper insert to promote flow. Meanwhile the twin screw feeder’s extraction geometry ensures material is drawn from the full width and length of the new hopper outlet. Ian Hancock, operations manager at Bradley Pulverizer, said, “From the high standard equipment supplied it is clear that Ajax understood our process and what we wanted to achieve. Working with Ajax’s technical director Eddie McGee on the IMechE’s Bulk Handling Committee I knew Ajax had experience of the flow issues occurring. Since the equipment has been installed the performance of the process has significantly improved; by providing complete control over the flow of phosphate powder Ajax’s equipment has allowed us to produce the high quality product desired”. 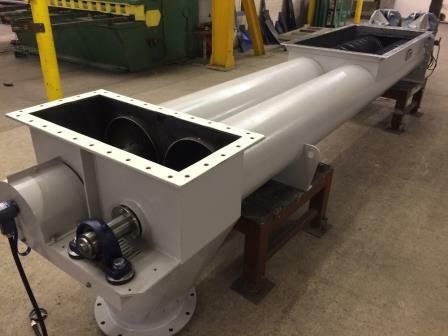 For more information on Ajax Equipment screw feeders and hopper design call +44(0)1204 386723, email: [email protected], or visit www.ajax.co.uk.